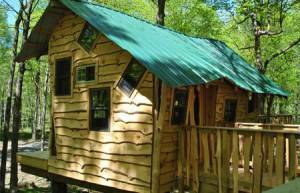 Rochester Rotary Sunshine Campus is home to a fully accessible treehouse built for campers of all ages and abilities. Now every Sunshine camper can experience what it feels like to spend time exploring high up in the trees, regardless of physical limitations. This treehouse features ramps wide enough to accommodate wheelchairs and sturdy enough to fit a whole cabin of excited children at one time. It is the first of its kind in the Finger Lakes region. A charming, eclectic clubhouse, which is the perfect spot for campers to create adventures even if rain is trying to dampen the fun. 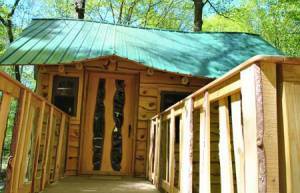 Complete with multiple doors and windows, this is another location for campers to create great memories. 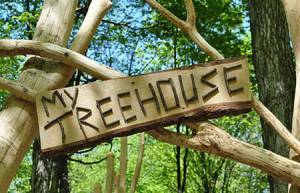 Oftentimes childhood treehouses are marked with handwritten signs reading “keep out!” or “boys only.” However, with the Rochester Rotary Sunshine Campus treehouse, you are greeted with a welcoming sign that reads “My treehouse.” This is the ideal name for an inclusive, all-are-welcome playhouse. Donation information: you can send a child to camp! Rochester Rotary was thrilled with the numerous donations of time, equipment, and dollars to fund the construction of the treehouse at Sunshine Campus. 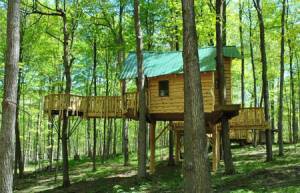 Now that My Treehouse is built, it’s ready for campers to climb high in the trees and create lasting memories. Donations are being accepted to send campers to attend Sunshine Camp and experience this treehouse firsthand. For more information, please contact Tracey Dreisbach, Executive Director of Rochester Rotary, at 585.546.7435, ext. 215 or Tracey@rochesterrotary.org. This treehouse project was a wonderful example of a community coming together for a noble cause and to provide Sunshine Campers with the best possible summer experience. Thank you to all the companies, families and individuals that played a part in this memorable project. Your support helped create this impressive treehouse, but you also helped to create priceless memories for years to come. 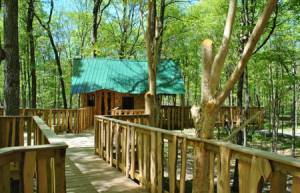 The treehouse at Rochester Rotary Sunshine Campus was designed and built by The Tree House Guys LLC, a nationally renowned firm that has constructed accessible treehouses across the country, including at Paul Newman’s Hole in the Wall Gang Camp in Connecticut.